Two mass graves connected to Colombia's decades-long internal conflict have been found, officials say. They say one grave, containing the bodies of 17 peasants, was discovered in a ranch in the north-west belonging to a late far-right militia leader. 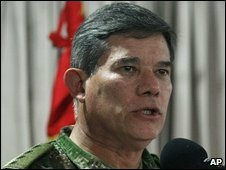 The armed forces chief announced the discovery of a second mass grave, which he said held the remains of 16 left-wing Farc guerrillas, in the south. The Farc have been fighting the Colombian government since the 1960s. The peasants' bodies were found on a ranch that belonged to paramilitary leader Carlos Castano, who was killed in 2004. The victims are believed to have been tortured and killed 10 to 12 years ago. Right-wing militias began demobilising in 2005 under a peace pact with the government. In the south, the rebel mass grave was discovered near La Uribe, a traditional stronghold of the Revolutionary Armed Forces of Colombia (Farc), Gen Freddy Padilla announced. He added that the Farc fighters had died in fighting in July, and that the bodies recovered included that of a nephew of senior Farc commander Jorge Briceno.